Offering protection from bright sun and cooler winds, Paravento is a fashionable side awning that also provides an inexpensive privacy solution. It is light yet sturdy, and can be installed in almost any application. The Paravento will add sophisticated style when coupled with Weinor’s latest patterns and fabrics. Textile options allow form and function, privacy and view during the day, and are a smart alternative to standard fixed solutions such as walls, fences and garden hedges. The Paravento can easily be fitted to any house wall or patio construction – both sideways or front. It can be mounted simply and quickly due to the corresponding attachments. The Paravento with trapezium shaped fabric is the ideal complement to a Weinor folding arm awning. As its shape corresponds to the angle of inclination of the awning, it creates a well-protected area with this combination – for additional side protection from inquisitive neighbours, low-lying sun and cool side winds. When it is retracted, the entire technology is concealed completely in the aluminium cassette of the Paravento. Paravento is not only an excellent complement to awnings, patio roofs and pergolas, in addition to its practical side protection, it also boasts the perfect accompaniment in frame colours and fabric patterns. The Paravento Side Screen is an attractive option that gives you the ultimate in privacy with the added protection from wind when you most need it. A stylish cassette allows the screen to disappear when not required. Weinor’s Exclusive Fabric Collection offers high quality, all-weather options to choose from. 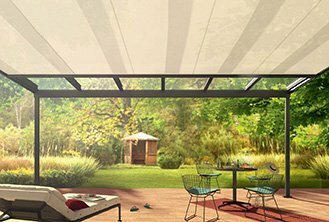 The Paravento awning complies with the requirements of the wind resistance class shown on the CE-conformity marking.